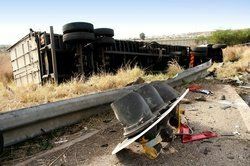 An accident caused by a large truck, or 18-wheeler, has the potential to cause grave injury to the other drivers involved. If you have been injured in a crash with a large truck, you may be entitled to compensation for your physical injuries and emotional suffering. Trucking accidents are unique because truck drivers are required to follow certain regulations and can be held liable when they fail to meet these standards. The attorneys at Owens Moss are experienced in trucking accident prosecution and are ready to help with your case. Records and other trucking data needed to build your case can be destroyed, so it is imperative that you act quickly after a crash. To speak with a truck accident lawyer at our Jackson, MS, office, contact us today. The laws that pertain to trucking drivers and their employers are complex compared to other vehicles on the road. The commercial drivers who operate 18-wheelers are trained and instructed to operate using the highest safety standards. Drivers are even subject to special regulations on the road, including lowered speed limits and restricted road use in some areas. Speeding - Truck drivers are restricted to special speed limits on major highways and some other roadways. When commercial drivers exceed these limits, they are placing other drivers at risk. Fatigue - Fatigue is a common problem associated with trucking accidents. While commercial drivers are required by law to take a certain amount of breaks and sleep a minimum number of hours before operating their vehicles, many fail to meet these constraints. Fatigue can reduce a driver's reaction time, greatly contributing to the likelihood he or she will cause an accident. Improper Turns - Due to their massive size, tractor-trailer trucks require a wide breadth for turning. When a driver fails to make a turn properly, it can result in a dangerous accident. Inadequate Training - In some cases, a driver may have failed to receive adequate training. Without proper training, commercial drivers put other drivers on the road at great risk of incurring an injury. Drug and Alcohol Use - Similar to any other type of motor vehicle accident, alcohol and drugs can play a significant role. The punishment for truck drivers who use drugs or alcohol while operating their vehicles is severe because of the danger this can pose. Failure to Maintain the Vehicle Properly - Commercial trucks are used on very long trips that cause their parts to wear out much more quickly than other vehicles. Trucking companies are responsible for maintaining each vehicle according to strict standards. When you select a lawyer to represent you after a truck accident, it is imperative that he or she has experience with this branch of law. The team at Owens Moss will thoroughly investigate every angle of your case to help you receive compensation from the liable parties involved. To learn more about how an experienced car accident attorney can help you begin healing and schedule a consultation, contact us today.